Just learned that Google is calling those temporary logos it puts up on its main search page "doodles." This is an affront to doodling, which has a dictionary meaning: "an aimless or casual scribble, design, or sketch; also : a minor work." 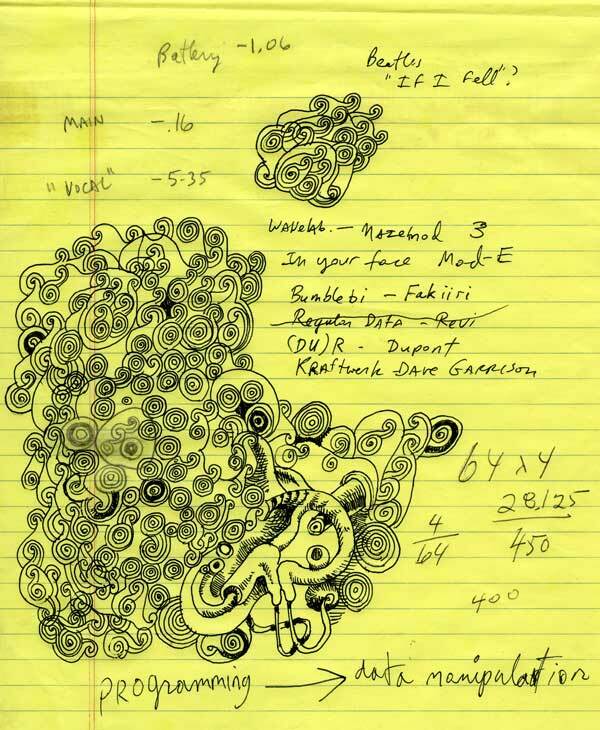 No argument about that last bit, but the whole point of doodling is that it's desultory, sloppy, half-assed, and used by psychiatrists as an indicator of psychic disequilibrium. Google's slick little vignettes, most of them barely clever, are none of the above. Fine if they want to call them "gooodles" or something but the word "doodle" is taken. Update: Google actually got a patent awarded for its logo fooling around, described as "systems and methods for enticing users to access a web site." Seems a bit, um, broad. One wonders if they are also pursuing a trademark claim that the dictionary word "doodle" is their exclusive property. My conversation with Jeanette Hayes about computing styles continued at last night's Speed Show (one of a series of exhibitions in internet cafes; last night's was organized by Lindsay Howard). Tom Moody was talking about Apple and Flash and then Jeanette Hayes walked in and said "it's so weird to see my blog on a PC!" Jeanette: "this is such a fun keyboard!" It's beige. Tom: "welcome to my life." Joking aside, an awkward aspect of art shows in internet cafes, I think, is having artists who are there by choice (using those clunky old PCs) displacing people needing to check emails, do e-commerce etc. Some of the regulars got a bit testy having to look for unoccupied workstations. Was impressed, however, to see that the computer chosen to host Erik Stinson's essay about the New Creativity (the focal point and inspiration for the show) was running Linux!